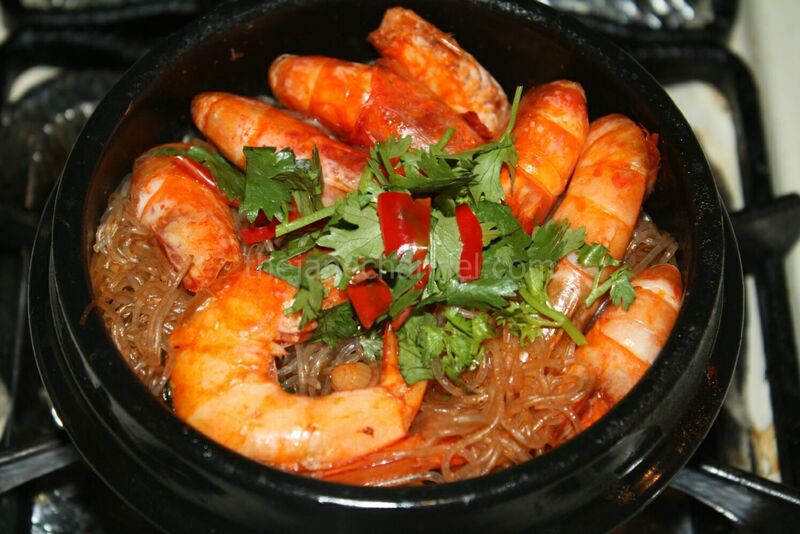 You may think that the main attraction of this dish is the shrimp. However, it’s really the cellphane noodle that is the star of the show. The humble cellophane noodle is found in many East Asian cuisines. The Chinese version is primarily made with mung bean (similar to the red bean but green in color) starch. It is very versatile, and can be used in soups, stir fried, steamed with seafood, or even used as filling in dumplings. It is similar to rice vermicelli in terms of the thickness, but has a different texture in that it is slightly harder to break (unless overcooked!) and feels more gelatinous. It can be found in most Asian grocery stores in dried form. As you’ll see below, you need to soak it in water for a while before it can be cooked. 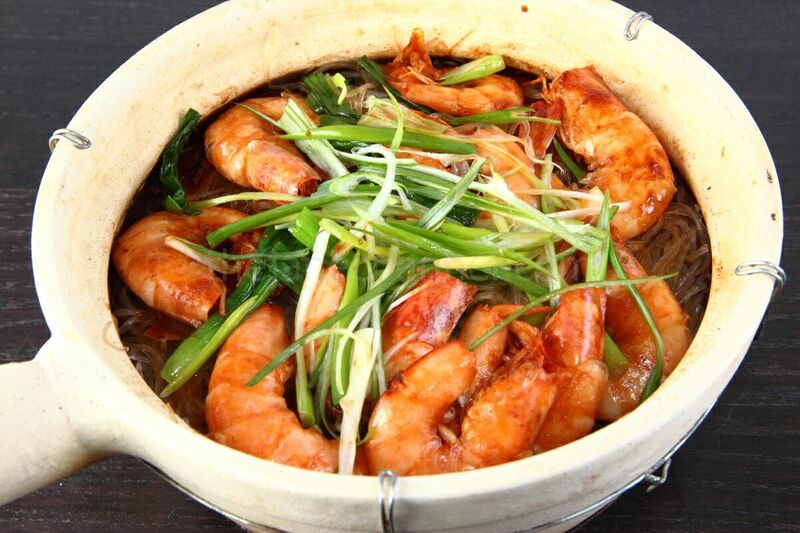 The main reason it exists in the recipe owes to its main characteristic in that it absorbs flavor extremely well. 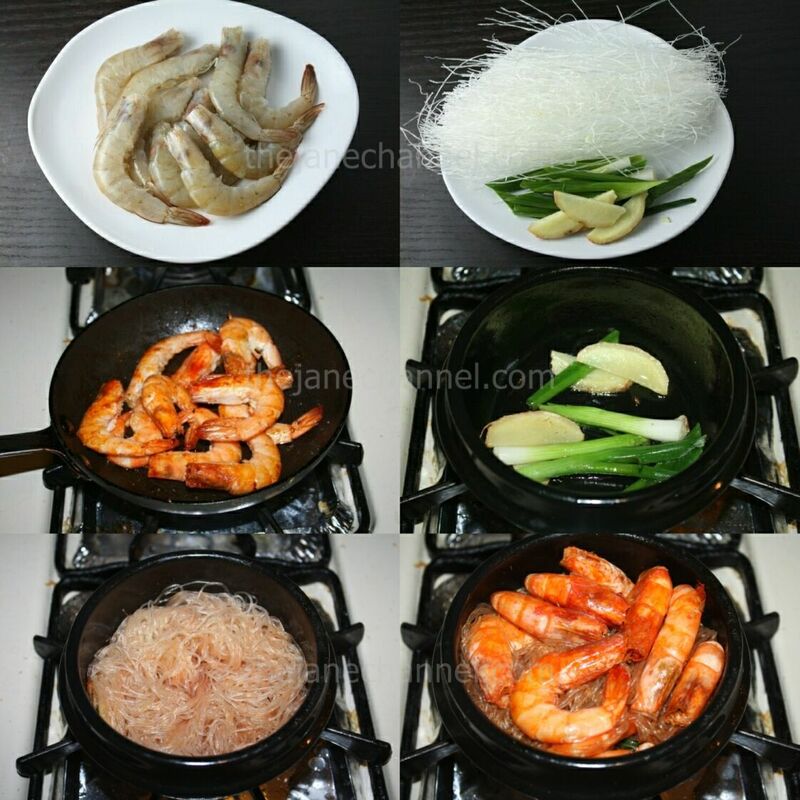 The juices from the cooked shrimp (using heads-on shrimp is important for better flavor and color), along with seasonings all get absorbed into the noodles. The end result is that the noodles become the most flavorful component of the dish, even more so than the shrimps. Heat oil in a skillet over medium-high heat. Cook shrimp for 2 to 3 minutes per side, or until opaque. Remove from skillet. Heat oil in a casserole over medium-high heat. Stir in gingers and scallions, until fragrant. Add shrimps and half of the sauce from Step 2. Stir evenly. Remove the shrimp from the casserole. Add vermicelli, chicken broth and the remaining sauce. Place the shrimps on top. Cover and simmer until all the sauce is absorbed by the vermicelli. Sprinkle cilantro and chili on top to serve. Looks so good! and great picture! This is a great recipe, thanks so much for sharing. i tried it once and it was really yummy although a tad salty. i think it was my mistake though, would recommend for anyone to try!